Hollow walls can be a problem when hanging heavy objects. In old houses the hollow walls will be of a "lathe and plaster" construction. In modern houses hollow walls will likely be plaster board. Either way they often may not be strong enough to hold certain things. The solution is often to locate the wall stud. 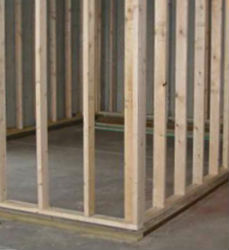 Wall studs are the vertical running timbers that give hollow walls strength. Wall studs are usually 2 inches wide and 4 -6 inches deep depending on the wall thickness. As such they offer a very sound material to screw long screws into and create a very strong fixing. So how do you locate your wall studs? 1 You can simply buy a stud detector. These electronic gadgets are fairly inexpensive and pretty reliable at finding the studs.Simply move the stud detector across the wall and it beeps when the stud is located. Mark that point with a pencil. 2 If you don't have a stud detector you can find them by trial and error. How far apart are wall studs? Wall studs are generally 16 inches apart but this may well vary and can be up to 24 inches apart. Try starting from the corner of the room or a door frame. Measure 16 inches. With a power drill and a very fine drill bit (2-3mm) drill a small investigation hole. The drill will go through plaster wilth very little effort If the wall is hollow. You will feel the drill go through easily. If the wall stud is behind that you will feel the solid wood stud. If you don't find it first go drill one inch either side of your first hole. Repeat this until you find the stud. Once you find the first stud measure across 16inches and try and find the next stud. Keep measuring and marking to locate all the studs you need.